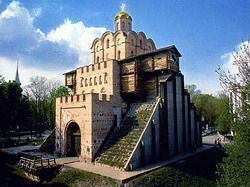 fortification tower that was named Golden Gate The legend says that before the final battle with powerful Pechenegs Yaroslav Mudry prayed and begged the Virgin to help him to defeat the enemy. He promised to build the church dedicated to the Mother of God in case of success. He did not forget his promise and ordered .to top Golden Gate with gilded-domed Annunciation Church. Until 1699 Golden Gate was decorated with the image of Our Lady of Kazan. The second birth of Golden Gate occurred in 1832, when archeologists discovered the ruins of old fortification construction. They were restored and fenced with metal iron. Kievers and guests of the city could admire the symbol of Russia's power. In 1970 it was decided to construct a pavilion that would protect the ruins and recreate the original look of Golden Gate. The museum exposition presents items related to the history of old Kiev, including weapons, everyday life objects and other exhibits that were found in the course of archeological excavations in the area of Golden Gate. It was discovered that the floor and the walls of old Annunciation church were covered with frescos and mosaics. It was the very church that was put up in honor of the Virgin as the gratitude for the victory over the Pechenegs, so the little pieces of smalt and plaster that were found are especially precious. The restored church was also decorated with mosaics and frescos. The reconstructed pavilion of Golden Gate was opened in May 1982, when the country celebrated the 1,500th anniversary of Kiev.